I purchased this to match my other daughters quilt. It is perfect! Great for a little girls room without being to “baby” looking! They both love them! Would definitely recommend for anyone needing a quilt for a little girl. It is not necessarily the warmest but very cute and washed very well! Doll up your child's room with this darling three piece quilt set. Crafted from 100-percent cotton, this bedding set features sweet grey, pink, violet, and white floral detailing. Available in both a twin and full/ queen size, this quilt and sham set is machine washable for easy care. very nice and good quality quilt and sham set. Bought for my granddaughters bed cover. Quilt appears to be hand stitched and well made. This is a very beautiful quilt set. I love the color and design on both sides of this reversible quilt. The quilt is not very warm at all, though. It is better suited for spring or summer. I am purchasing a fleece blanket to use over the quilt for the winter months. Cute and did it's job. Nothing spectacular. Just a quilt and sham set for a little girl. couldnt be happier with my purchase ! I just want to say this quilt set is much prettier in person than pictured ! the colors are so delicate and feminine . 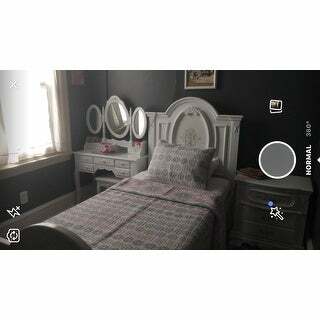 the pinks and greys and lilacs are just beautiful for a girls bedroom ! very good quality . well made ! FAST DELIVERY from overstock.com as usual !!! I just love this quilt set! Great quality and so pretty! Love this quilt! Beautiful colors! We bought this as a gift for our two year old daughter who just moved into a big girl bed. The pattern is beautiful on both sides of the quilt, it is comfortable, and good quality! I highly recommend this product! Very pretty quilt. Washed very nicely following wash and dry instructions. I love quilts because they are much easier to wash then comforters. Beautiful fit on my daughters bed. Cant wait til her headboard comes! Cute bedding for the little princess’ room!! The quilt is very cute and of good quality. Would definitely recommend! Love this for our Grandaughters bed. Soft pastel colors are perfect for their room. This was purchased for my daughter and she loved it. She had grown out of the Disney princess bedding and wanted something more mature. You really can't get quilts for this price from what I've seen. It's soft and comfortable. We have owned it for almost a year and still looks new in appearance. My daughter loves it. No issues with the quality of the bedding, and my daughter loves it! There are very little of the big flowers over 80 % is small flowers on it. Quilting looks nice but am disappointed in the pattern on site it shows more. Great quality and matched the pictures - recommend! "Where can I purchase the decorative pillows that are shown on he full size set?" Unfortunately, we do not carry thee decorative pillow at this time. "What kind of closure do the shams have ?" "Hello. If I purchase this item would I be able to purchase an additional sham with it?" We do not sell parts of sets, sorry. "Is there a bed skirt that I could use with this ? " "What color sheets and pillows do you offer that would go with this set?" Hello jwhite123, thank you for your question. I think light pink, grey or white would go beautifully with this set. We have many sheets to choose from. You can view them here. http://www.overstock.com/Bedding-Bath/Sheets-Pillowcases/Twin,/size,/459/dept.html Have a great day! "Will this quilt fit a full size mattress?" Hello daneygirl, no, this is a twin size. Unfortunately, we do not offer this quilt in any other sizes. Please let us know if you have any further questions. Do you have this in a full size? My daughter has a full/twin bunk bed and I wanted coordinating bedding for it.